Surya's film with Murugadoss, opposite Shruti Hassan, 7am Arivu is nearing the finish line, and it is one of the most awaited films of the year. Apparently he plays a circus acrobat in the film and has worked hard to pull off this difficult role. Unit members were dazzled with the dizzying acrobatics he has performed in this film. They were so impressed that the makers begged him to show off some of his moves to the audience at the audio launch for the film which is to be held this month. Being the good sport he is, Surya has agreed. This spectacular event is to take place at Nehru stadium and Kalaignar TV has obtained the broadcasting rights. Udhayanidhi's Red Giant Movies is producing the film. Therefore the trailer for his Oru Kal Oru Kannadi will also be released simultaneously. Not only Tamil cinema fans but even folks in Bollywood and the Telugu film industry are counting off the days to its release. Murugadoss had reportedly turned down many Bollywood projects so that he could do this film! 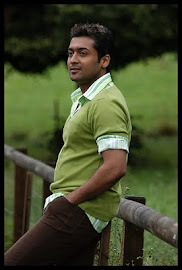 His confidence in his film and Surya is immense.